This week is the premiere of the first part of The Remote Series, produced by Skálar FM and commissioned by the Creative Audio Unit of ABC Radio National, Australia for their weekly radio art program Soundproof. Listen on air, online or download the series prologue Trilogy for Night and Radio: Radiotelegraph/Night Fall/Relay, a three-part sound work by Anna Friz and Konrad Korabiewski. Autumn in the far north is characterized by a dramatic loss of daylight. In Seyðisfjörður, a small village on the far eastern edge of Iceland just below the Arctic Circle, each day in October has eight minutes less daylight than the one before. The sun is slower each day to crest the mountains which ring the fjord, until mid-November when it no longer rises above the mountains, and the town experiences only indirect light until February. Trilogy for Night and Radio is a radio art work in three parts that explores remoteness, the descent into darkness and the long Northern winter night. Trilogy is a collaborative exchange between two traveling sound artists – Anna Friz and Konrad Korabiewski – that meditates on feelings of place using the materiality of signals, overlapping remote geographical spaces. As part of the work, we recorded, performed, re-recorded, and composed with sounds and signals from Iceland and Slovenia, with a relay broadcast to Chicago. Radiotelegraph, is a beacon in spoken morse code, designed by Anna for unlicensed radio simulcast in Seysdisfjördur, Iceland, and in Chicago, U.S.A on the Radius platform in October 2013. Incorporating performed morse code, electronics, and sampled radio signals, Radiotelegraph reflects Seyðisfjörður’s remote location in a deep fjord off the Atlantic Ocean, which was also the site of the first telegraph cable connection between Iceland and Europe in 1906. Night Fall is an improvised live performance by Anna and Konrad for unlicensed low-watt transmission in Seyðisfjörður to accompany the shift from sundown into full night time darkness. 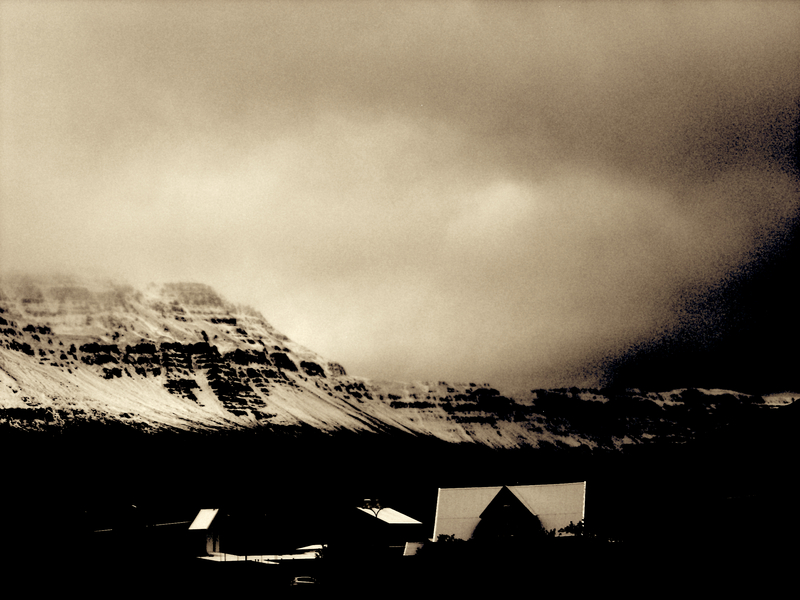 Night Fall elaborates on the sonic palate created in part one, with a soundscape that contemplates the acoustic and electro-magnetic landscape of Seyðisfjörður in the disappearing light of dusk and the feeling of suspended or expanded time that strongly characterizes this village in east Iceland. The performance was recorded live from a small transistor radio receiver, and edited. The final segment, Relay, is built from recordings made by Anna and Konrad around the winter solstice (December 21-22) in the empty post-industrial spaces in which they were working–Anna in a former tobacco factory in Ljubljana, Slovenia; Konrad in an empty herring factory in Seydisfjördur. They intertwined these traces and signals from distant spaces, using the architecture and landscape as a filter for their signals. Anna took elements from Radiotelegraph and replayed them into the iron bannisters and wooden walls of the tobacco factory using tactile transducers, or speakers which transmit vibrations into surfaces. These signals were re-recorded using contact microphones, and sent to Konrad, who mixed them together with field recordings from different houses and the empty herring factory. Trilogy for Night and Radio is the prologue to the four part Remote Series, which will air on Soundproof in early 2015 and will feature artists Tumi Magnússon (Iceland), Fernando Godoy M (Chile), Jana Winderen (Norway) and Christina Kubisch (Germany). Trilogy for Night and Radio was produced for the Creative Audio Unit with additional support from the Danish Arts Foundation, the Danish Composer’s Society, radioCONA, Kultural Center Tobačna 001, Skaftfell Center for Visual Arts, and Radius.